Intraoperative photo of the thoracic duct low in the neck on the left. Chylous fistulas are known to lead to prolonged hospitalization. Clinically, chylous fistulas may be difficult to manage because of significant electrolyte, fluid, and protein abnormalities that are associated. Chylous fistula is an infrequent complication of head and neck surgery, with an incidence reported in 1-3% of patients undergoing major neck surgery. This condition has a predilection for the left side of the neck, but up to 25% of cases involve the right side of the neck. The thoracic duct is the conduit for lymph and dietary fat to reach the venous bloodstream. The flow of chyle is around 2-4 L per day and consists of fat, protein, electrolytes, and lymphocytes. [4, 5, 7, 8] Its daily production is dependent on the diet and daily dietary intake. Indications for surgical intervention in patients with cervical chylous fistula remain unclear. A chyle leak identified intraoperatively warrants immediate repair. Success of surgery declines in the postoperative period because of fibrosis and the effect chyle has on the soft tissue of the neck. However, failure of medical therapy and radiological intervention advocates neck exploration or ligation of the thoracic duct, particularly in patients with high-output fistulas. The thoracic duct is the largest lymphatic vessel in the body, transporting lymph and chyle from lower limbs, the abdomen, the left hemi thorax, and the left side of the head and neck to venous circulation. It originates anterior to the body of second lumbar vertebra, the cisterna chyli, and ascends, along the right side of vertebral column, through the aortic hiatus of the diagram into the posterior mediastinum, traveling between the aorta and azygous vein towards the fifth thoracic vertebra, where it crosses to the left and continues to ascend up into the neck. In the neck, the thoracic duct raises 3-5 cm above the clavicle before arching back toward the junction of the left subclavian vein with the left internal jugular vein. Intraoperatively, the thoracic duct can be identified as it courses anterior to the vertebral and thoracocervical vessels between the internal jugular vein and the anterior scalene muscle. 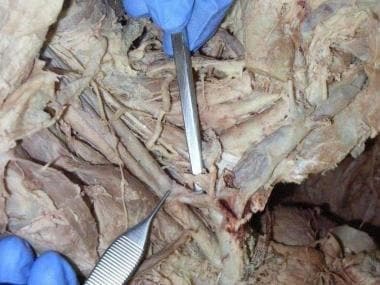 Thoracic duct inserting at the junction of internal jugular and subclavian vein in a cadaveric specimen. No absolute contraindications to surgical repair of cervical chylous fistula exist. Complications. Watkinson JC, Gaze MN, Wilson JA, eds. Stell & Maran's Head and Neck Surgery. 4th ed. Oxford: Butterworth Heinemann; 2000. 88. Allen DP, Briggs CE. Wounds of the thoracic duct occurring in the neck. Resume of 17 cases. Am Med. 1901. 20:401-404. Stuart WJ. 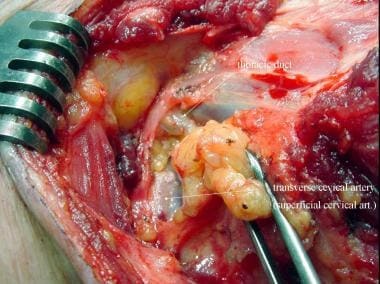 Operative injury of the thoracic duct in the neck. Edin Med. 1907. 22:301-302. Crumley RL, Smith JD. Postoperative chylous fistula prevention and management. Laryngoscope. 1976 Jun. 86(6):804-13. [Medline]. Modi GK, Bhowmik D, Padmanabhan S, et al. Lymph leakage following subclavian vein catheterization. Nephrol Dial Transplant. 1999 Feb. 14(2):447-8. [Medline]. Nussenbaum B, Liu JH, Sinard RJ. Systematic management of chyle fistula: the Southwestern experience and review of the literature. Otolaryngol Head Neck Surg. 2000 Jan. 122(1):31-8. [Medline]. Kassel RN, Havas TE, Gullane PJ. The use of topical tetracycline in the management of persistent chylous fistulae. J Otolaryngol. 1987 Jun. 16(3):174-8. [Medline]. al-Khayat M, Kenyon GS, Fawcett HV, Powell-Tuck J. Nutritional support in patients with low volume chylous fistula following radical neck dissection. J Laryngol Otol. 1991 Dec. 105(12):1052-6. [Medline]. Marsac, Huchon, Bismuth. Pleural chylous effusion. Chretien J, Bignon J, Hirsch A. The Pleura in Health and Disease 30. Informa Health Care. 1985. 237-238. Santaolalla F, Anta JA, Zabala A, Del Rey Sanchez A, Martinez A, Sanchez JM. Management of chylous fistula as a complication of neck dissection: a 10-year retrospective review. Eur J Cancer Care (Engl). 2010 Jul. 19(4):510-5. [Medline]. Langford RJ, Daudia AT, Malins TJ. A morphological study of the thoracic duct at the jugulo-subclavian junction. J Craniomaxillofac Surg. 1999 Apr. 27(2):100-4. [Medline]. Shimada K, Sato I. Morphological and histological analysis of the thoracic duct at the jugulo-subclavian junction in Japanese cadavers. Clin Anat. 1997. 10(3):163-72. [Medline]. Bhargava N, Bhatt S, Bhargava SK, Jain S, Gupta P. Right sided supraclavicular chyloma: Radiographic findings and role of imaging in diagnosis. Indian Journal of Radiology and Imaging. 2003. 13(1):27-29. Sugiura K, Tanabe Y, Ogawa T, Tokushima T. Localization of chyle leakage site in postoperative chylothorax by oral administration of I-123 BMIPP. Ann Nucl Med. 2005 Oct. 19(7):597-601. [Medline]. Cernea CR, Hojaij FC, De Carlucci D Jr, et al. Abdominal compression: a new intraoperative maneuver to detect chyle fistulas during left neck dissections that include level IV. Head Neck. 2012 Nov. 34(11):1570-3. [Medline]. Dhiwakar M, Nambi GI, Ramanikanth TV. Drain removal and aspiration to treat low output chylous fistula. Eur Arch Otorhinolaryngol. 2014 Mar. 271(3):561-5. [Medline]. Sharkey AJ, Rao JN. The successful use of octreotide in the treatment of traumatic chylothorax. Tex Heart Inst J. 2012. 39(3):428-30. [Medline]. Barili F, Polvani G, Topkara VK, et al. Administration of octreotide for management of postoperative high-flow chylothorax. Ann Vasc Surg. 2007 Jan. 21(1):90-2. [Medline]. Chan JY, Wong EW, Ng SK, van Hasselt CA, Vlantis AC. Conservative management of postoperative chylous fistula with octreotide and peripheral total parenteral nutrition. Ear Nose Throat J. 2017 Jul. 96 (7):264-7. [Medline]. Wei T, Liu F, Li Z, Gong Y, Zhu J. Novel Management of Intractable Cervical Chylous Fistula with Local Application of Pseudomonas aeruginosa Injection. Otolaryngol Head Neck Surg. 2015 Oct. 153 (4):561-5. [Medline]. Hehar SS, Bradley PJ. Management of chyle leaks. Current Opinion in Otolaryngology & Head and Neck Surgery. 2001. 9:120-125. Gregor RT. Management of chyle fistulization in association with neck dissection. Otolaryngol Head Neck Surg. 2000 Mar. 122(3):434-9. [Medline]. Cheng L, Lau CK, Parker G. Use of TissuePatch™ sealant film in the management of chyle leak in major neck surgery. Br J Oral Maxillofac Surg. 2014 Jan. 52(1):87-9. [Medline]. Mingxing L, Guowen S, Zhiyong W, Wei H. Novel management of intractable chylous fistula with the application of an impression paste. J Craniofac Surg. 2013 Sep. 24(5):e498-9. [Medline]. Campisi CC, Boccardo F, Piazza C, et al. Evolution of chylous fistula management after neck dissection. Curr Opin Otolaryngol Head Neck Surg. 2013 Apr. 21(2):150-6. [Medline]. Spiro JD, Spiro RH, Strong EW. The management of chyle fistula. Laryngoscope. 1990 Jul. 100(7):771-4. [Medline]. de Gier HH, Balm AJ, Bruning PF, Gregor RT, Hilgers FJ. Systematic approach to the treatment of chylous leakage after neck dissection. Head Neck. 1996 Jul-Aug. 18(4):347-51. [Medline]. Velegrakis GA, Prokopakis EP, Papadakis CE, Bizakis JG, Kyrmizakis DE, Helidonis ES. Management of chylous fistula using the fibrin adhesive set. ORL J Otorhinolaryngol Relat Spec. 1998 Jul-Aug. 60(4):230-2. [Medline]. Kirse DJ, Suen JY, Stern SJ. Phrenic nerve paralysis after doxycycline sclerotherapy for chylous fistula. Otolaryngol Head Neck Surg. 1997 Jun. 116(6 Pt 1):680-3. [Medline]. Kirse DJ, Stern SJ, Suen JY, Rudnicki S, Roberson PK, Schaefer RF. Neurotic effects of doxycycline sclerotherapy. Otolaryngol Head Neck Surg. 1998 Mar. 118(3 Pt 1):356-62. [Medline]. Patel N, Lewandowski RJ, Bove M, Nemcek AA Jr, Salem R. Thoracic duct embolization: a new treatment for massive leak after neck dissection. Laryngoscope. 2008 Apr. 118(4):680-3. [Medline]. van Goor AT, Kroger R, Klomp HM, de Jong MA, van den Brekel MW, Balm AJ. Introduction of lymphangiography and percutaneous embolization of the thoracic duct in a stepwise approach to the management of chylous fistulas. Head Neck. 2007 Nov. 29(11):1017-23. [Medline]. Pamarthi V, Stecker MS, Schenker MP, et al. Thoracic duct embolization and disruption for treatment of chylous effusions: experience with 105 patients. J Vasc Interv Radiol. 2014 Sep. 25(9):1398-404. [Medline]. Kent RB 3rd, Pinson TW. Thoracoscopic ligation of the thoracic duct. Surg Endosc. 1993 Jan-Feb. 7(1):52-3. [Medline]. Lapp GC, Brown DH, Gullane PJ, McKneally M. Thoracoscopic management of chylous fistulae. Am J Otolaryngol. 1998 Jul-Aug. 19(4):257-62. [Medline]. Boccardo F, Bellini C, Eretta C, et al. The lymphatics in the pathophysiology of thoracic and abdominal surgical pathology: immunological consequences and the unexpected role of microsurgery. Microsurgery. 2007. 27(4):339-45. [Medline]. Boccardo F, Campisi CC, Molinari L, et al. Lymphatic complications in surgery: possibility of prevention and therapeutic options. Updates Surg. 2012 Sep. 64(3):211-6. [Medline]. Postma GN, Keyser JS. Management of persistent chylothorax. Otolaryngol Head Neck Surg. 1997 Feb. 116(2):268-70. [Medline]. Eufinger H, Lehmbrock J. [Life threatening and fatal complications of radical neck dissection]. Mund Kiefer Gesichtschir. 2001 May. 5(3):193-7. [Medline]. The authors would like to thank Dr Jeroen DF Kerrebijn from the Eramus Medical Centre in Rotterdam for his permission to use the intraoperative photo, as well as Mr Philip Adds from the anatomy department at St George's Medical School, London, for kindly dissecting a thoracic duct in a cadaveric neck, which enabled us to demonstrate the site of insertion of the duct into venous circulation.